The Illusionists 1903, the third show from the producers who started it all with The Illusionists, is now on tour in Australia. I've been following this show closely, well as closely as I can being that I'm in the US and they are an ocean away. 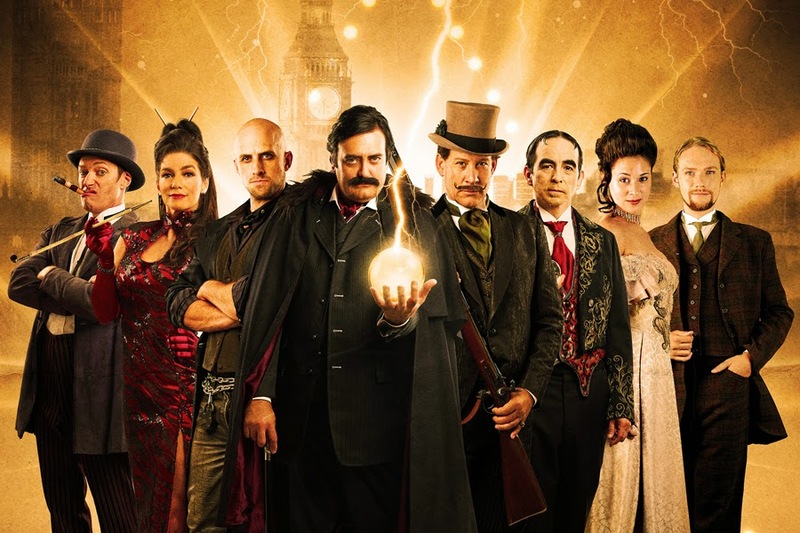 The Illusionists 1903 is not Steampunk and not quite Victorian, though some aspects of it are. They call it 'Magic From the Golden Age', but even that is a bit of a deception. Some of the effects might have their origins in the Golden Age of Magic, but from I have seen it's all pretty much modern material made over to look older. Now is that a problem? NO!!! Not at all. It's not even a critique of the show, it's just what they have done. And by all accounts they've done it in a fantastic manner. The formula for The Illusionists is a multi-performer cast, with no M.C., live music, and great magic. The success of the two previous shows proves that this formula works, and works well. In 1903, they have a good mix of top notch performers. They all get a special moniker for being in the show. The artists include: The Immortal-Rick Thomas, The Eccentric-Charlie Frye, The Daredevil-Jonathan Goodwin, The Showman-Mark Kalin, The Conjuress-Jinger Leigh, The Clairevoyants-Thommy Ten & Amelie van Tass, and The Maestro-Armando Lucero. What's in the show you ask? Well, I can only go by some of the reviews and the photos that I've seen, but it appears that there is an upside down straight jacket escape involving fire that looks pretty intense. There is a two person mentalism sequence that is truly from that time period. There looks to be a bullet catch presented by Mark Kalin, but I don't know who is doing the catching. I've seen a great photo of Mark's wife Jinger Leigh with a gold floating ball. I am wondering if that is actually Okito's Floating Ball (not a copy, but OKITO's actual floating ball). I'm not sure what the other acts are doing specifically, but I can tell you they are all fantastic performers so rest assured their material is going to be really strong. The reviews I've read have all been favorable. "This time the mood was more subdued, the tricks less flashy; but then the setting was the turn of the 20th century when artists didn’t have the luxury of modern technology. They used skill and showmanship and that’s what we got. We might all have seen the illusions before, but it was not the tricks so much as the way they were performed, with deftness, humour – and always with one extra twist at the end of the act. " "Accompanied almost continuously by an inspiring and at times moving score effectively tagging along with the action, a skilful fusion of theatrical timing, presentation and production value, this franchise demonstrated family entertainment teetering on world class heritage. Sure we’ve seen some of these acts before but this is edge-of-seat, gob smacking entertainment with just as much pulling power as Hollywood in her full glory, CGI and special effects included. And it’s live." They debuted at the Queensland Performing Arts Center and now are at the Adelaide Festival Centre until Jan 25th. I don't know where the tour goes after that, but I"ll try and let you know.